Silks, gold and mallipoo rule this season. But amidst the richness, a group of seven classical dancersa��dressed, in stark contrast, in simple black, red and greya��plan to challenge traditions with an innovative contemporary performance. The brainchild of danseuse Anita Ratnam, Float & Padme is an experiment that seeks to deepen a dancera��s experience of her body, craft them into better performers and open up new spaces and opportunities. a�?Over the last 25 years, Ia��ve been working to bring contemporary validity to classical dance. Having lived in more than one continent, and having incorporated many influences in my performances, I couldna��t understand why the training systems here were so lacking,a�? begins the city-based Bharatnatyam dancer, explaining how she thought up the project. 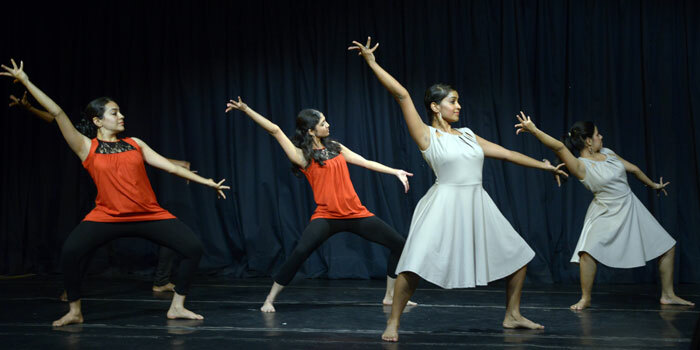 A nation-wide audition call in 2013 got 29 applications (the majority from Bangalore and one from Chennai), of which she short-listed seven classical dancers. a�?I had seen choreographer Kalpana Raghuraman perform Padme, a contemporary dance work she had created for women of Indian origin in the Netherlands, and it fit what I wanted. So I invited her to work with my dancers,a�? she says. A year in training, the dancers were put through everything from dietary discipline and fitness to Tai chi classes. a�?Padme takes its inspiration from the Buddhist symbolism attached to the lotusa��signifying the blossoming of the human spirit. Kalpana was able to reinvent it and experiment more with technique with our dancers as they are better trained,a�? informs Ratnam. The show premiered in Bangalore in August this year, with musica��on a three-year license from the Korzo Theatre, Netherlandsa��specially composed to suit the choreography. However, the music in the first half of the one-hour performance will be original. a�?Pianist Anil Srinivasan will play live as part of Float, weaving both western and Indian classical. While in Bangalore he played everything from Beatles, Bach and Bharathiar, this time he will change some things around. But the essence will be to suspend the audience between two worldsa��of India and somewhere else, of popular music and something else,a�? she says. Float & Padme has been designed to be flexible as far as performance areas go. a�?I want my dancers to perform at malls, cafes and brew rooms. These are the spaces where people of their own age hang out. At present, dance is not a part of the urban Indian landscape and we need to design it to be so,a�? Ratnam explains, adding that she also wants to explore corporate sponsorship next. a�?Currently, we have more questions than answers on what the possibilities are for the future and what kind of capsules we can do. But then again, I feel these kinds of projects need to have an open framework,a�? she signs off.